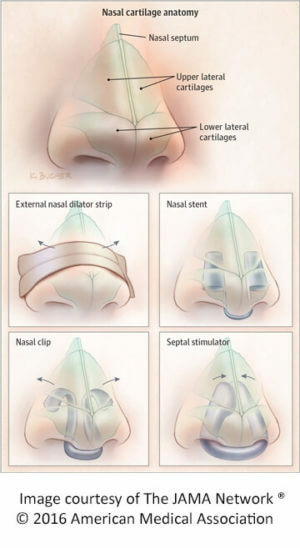 Mute nasal device is a pair of nasal cones or dilators that are positioned just inside the nostrils and opens the nasal passage to promote easy nose breathing. This enables users to breath more freely through the nose instead of the mouth, reducing vibrations from occurring in the back of the mouth which produce the sound of snoring. The nasal dilators are made from a soft medical grade plastic and can be used up to 7 times per pair. Mute is an effective snoring solution that is easy to use and affordable. The Parent company that owns Mute is a Melbourne, Australia based company called Rhinomed. Rhinomed has over 60 medical technology patents that target breathing. They have developed the Mute technology as well as a sister brand called the Turbine, which is another nasal dilator made for high-intensity exercises like cycling. Rhinomed has been publicly traded on the Australian Stock Exchange since 2008. Rhinomed is currently researching and designing an Intranasal Positive Expiratory Airway Pressure device that will act as a treatment for sleep apnea. 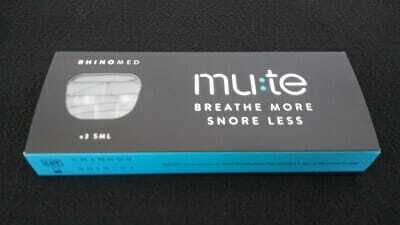 Mute targets snoring by promoting airflow through the nose. Snoring can occur in nose breathers and mouth breathers. A nose breather is typically defined as one who breathes through the nose while the mouth is closed. A mouth breather is one who can breath through the nose but may be experiencing congestion due to illness or sinuses, thus opening their mouth at night in order to breathe. 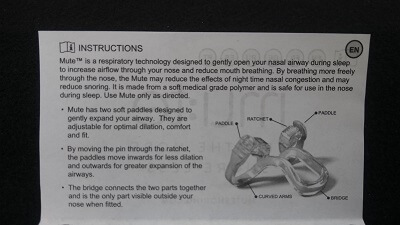 Mute can be used by both nose breathers and mouth breathers. 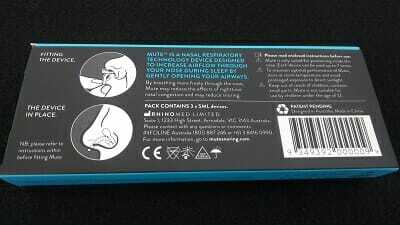 The Mute dilators will be more effective for mouth breathers because there is apparently an airflow issue with their nose if they breathe through their mouth most of the time. The user could have a deviated septum or nasal congestion for example, and the Mute dilators can help direct air through the nose and cut down on breathing through the mouth which can cause very disruptive snoring. Often times when you breathe through your mouth, the throat muscles relax and your airway becomes blocked. When the airway is blocked, a vibration occurs in the throat tissues and the sound of snoring begins. Mute is a great anti-snoring option for those affected by a deviated septum. It’s important to remember that this product is not intended to be used for the treatment of Sleep Apnea. Obstructive Sleep Apnea, or OSA, is a serious condition where one’s breathing patterns while sleeping are interrupted repeatedly and you actually stop breathing. During these interruptions, the brain is not receiving oxygen, let alone the rest of your body. There are two types of sleep apnea – both of which are separate sleep disorders. The difference between obstructive sleep apnea and central sleep apnea is that obstructive sleep apnea occurs from a direct airway blockage. When the soft palette tissues in the back of the throat collapse during the night, this leads to the blockage of airflow and one stops breathing. Central sleep apnea has the same impact of not breathing, however, instead of a physical blockage in the airway, a failed signal from the brain prohibits the body from breathing instead. This typically means that the respiratory system is not functioning properly. Mute claims that 75% of partners noticed a decrease in the amount of snoring and the volume of snoring while using Mute. Couples from the same study also claimed that Mute was more effective at treating snoring than various other products on the market. Another study, done outside of Mute research, was conducted by students from the University of California at Irvine. Students compared several different nasal dilators and concluded that dilators open up the internal nasal valve. This valve can be easily obstructed for various reasons including congestion, a deviated septum, or various sinus issues. Mute is available for purchase at several retailers including Walgreens, Walmart, Jet.com and on their website. You may find that the product itself may not be in a physical store but rather stocked for online orders only. How Much does Mute Sleep Cost? The Mute retails for $27.95USD + $5.95 shipping. This price is for the 3-Pack of size-specific refills. There is also a trial pack available for $19.95USD + shipping that offers one of each size Mute so that you can test out the sizes and order the refill pack in the size that fits the best. If you shop around online, you may be able to find a more affordable price than what Mute offers on their website. Standard US shipping through USPS is available for any size product for $5.95 and should arrive within 3-5 days domestically. International shipping charges and longer delivery times will be incurred for any order outside of the US. Rhinomed has a 60-day return policy on any product that is faulty, defective, or damaged upon arrival. Since the product is being placed in the nostril, there are no refunds or returns on opened products. This should be understood by all, as the product is being placed in the body. Mute is available in Small, Medium, and Large Sizes and they do not offer exchanges if the size you receive does not fit. This is most likely why they offer the trial pack – which includes 1 of each size so you can determine which size to order next time. My Mute arrived neatly packaged in a paper sliding tray with an instruction booklet neatly tucked in the packaging. The packaging looked slightly different from what I saw online though. The package was more vertical, whereas the packaging I received was more horizontal. I ordered size small since my nose is rather petite. Wash your hands before opening the packaging. Open one of the sealed compartments and remove only 1 of the dilators. Hold the bridge with the curved arms facing towards you and insert the paddles into both nostrils. Slowly insert the curved arms first and then wiggle the bridge a little bit in order to fit the paddles into your nose. You will need to move the bridge towards the tip of your nose, or possibly lower on your nose to achieve a comfortable fit. The paddles can be adjusted in case you need them to be larger or smaller. 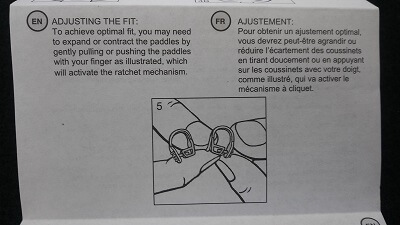 Take the Mute out of your nose and gently push or pull each paddle out in order to activate the adjustable ratchet. Then repeat steps 2-3. You should rinse the product after each use and store it in a cool dry area. Mute recommends using the dilator for up to 7 times per pair and rinsing it off before each use as well. I’ve been using anti-snoring devices for several years now and like all new products I try, I typically use the device for 2 weeks at night in order to accurately compare products. The first night I used Mute, I noticed that the nose dilators fit into my bedtime routine just fine. I had Mute sitting next to my bed on my nightstand and after finishing reading for the evening, I simply slid the nose dilator into each nostril. I adjusted it a bit to make sure it was securely in place. 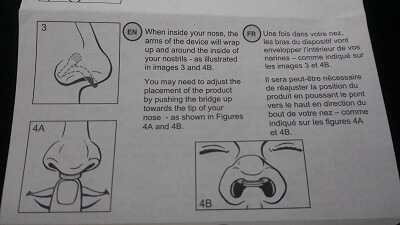 It did feel a bit awkward at first by having something in my nose, however, you can immediately feel Mute pushing on either side of the nostril and really opening up the nasal passage. The next morning when I woke up, I felt well rested and assumed that my snoring was stopped. I asked my wife if she had heard me the night before and she said no. I guess it did the trick! After 7 days of use, I noticed initially that my nose was a bit sore in the morning from the dilator. Towards the end of the week, the soreness wore off and my nose seemed to have been ‘broken in’ after several nights of use. I noticed it was not in place when I woke up in the middle of the night. I think the key to having a good experience with this product is to make sure you are buying the correct size. Since Mute is available in three sizes- small, medium, and large, it’s important that you know which size will fit the best. If Mute is too small, it will not properly open up the nasal passage and may actually obstruct airflow through your nose. If Mute is too large, it may be really uncomfortable and can cause soreness in your nose from stretching it out too much. 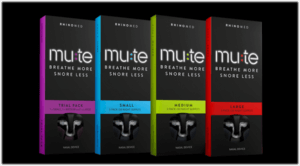 Mute offers a trial pack that is available in 3 sizes. My personal opinion is to order the trial pack first and try all sizes out. Then when you need to reorder, you can order the perfect size. Remember, that Mute does not allow you to return the product if it’s open, so you really want to be sure you are ordering the correct size, as they will not accept any returns unless of course it’s defective or arrives damaged. in a custom fitted snoring mouthpiece. This can last for up to one year or more before replacing. 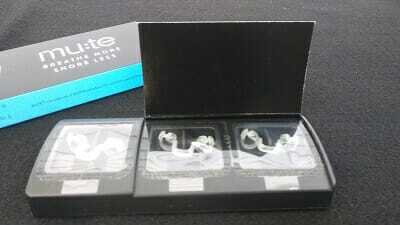 Some of my favorite mouthpieces can be found and compared here. Not everyone will be comfortable with molding and fitting a mouthpiece, but that is the route I would go. Also, if you find yourself to be more of a mouth snorer, Mute may not be as effective as a snoring mouthpiece would. In the end, you need to make the best decision for yourself in order to stop your snoring. Make sure you weigh all of the benefits of nose dilators like Mute versus other products like tongue stabilizing devices. Whichever product you end up choosing, I wish you a snore-free night’s sleep. Breathe Right Nasal strips for snoring – Do they really work? Previous post: Can Erectile Dysfunction Be Caused By Snoring?